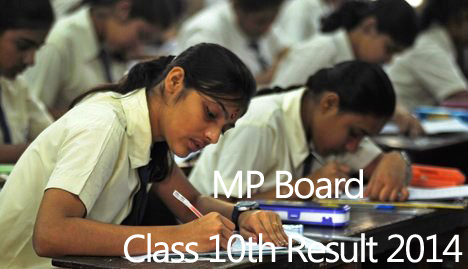 MP Board 10th Result 2014 Declared Online. MPBSE 10th Class Result Available at mpresults.nic.in. Madhya Pradesh Board of Secondary Education, Bhopal MPBSE has finally announced the final date of MP Board 10th Result 2014 Declaration which is scheduled to be declared on 15th May, 2014 at 11.00 AM on the official website of education board- www.mpbse.nic.in. All the students appeared in the MP Board Class 10th Exam 2014 are eagerly waiting for the final declaration of exam results and they will be able to check MP 10th Class Result 2014 on its official website of school board- www.mpbse.nic.in on 15 May, 2014 Morning. The wait is over and all the students waiting for the MP Board 10th Result 2014 can check their results after 11 AM today dated 15th May, 2014. Around 11.27 lakh students had appeared in the class 10th board examination conducted by Madhya Pradesh Board of Secondary Education (MPBSE). This year, the class 10th examinations started from 3rd March and ends on 29th March, 2014, held at more than 3500 exam centers across the state. MPBSE is the secondary education board in Madhya Pradesh and is responsible for all the exam activities and management of high school (Class 10) and higher secondary school (Class 12) examinations within the state. MPBSE conducts 10th and 12th examinations every year and declares their results on its official website in the month May. This year, it is officially announced that the MP Board 10th Result 2014 will be available online on May 15 at 11.00 AM. The official website of MP Education board – www.mpbse.nic.in and results will be available also on www.mpresults.nic.in. How To Check MP Board 10th Class Results 2014 Online? Students can check their exam results on the following direct links of main servers and alternative servers. Main servers provided by the education board while alternative servers are the servers provided by online exam result portals like indiaresults, jagranjosh etc. In case of main server is taking too much time to load or getting down, you can use alternative links to check your results online otherwise you should go at Main servers to check results and download the marksheet for any further use of admission etc. You should know your roll number while checking the results so that you can download the marksheet directly otherwise you’ve to search your full name using the name wise search or school wise search. If you don’t have internet or don’t have reach to the internet then you can also get your exam result through SMS. Please follow the below procedure to get MP Board 12th Result 2014 via SMS on Mobile. The MPBSE board examination results has already been published. Candidates can check it at official website of mp results.